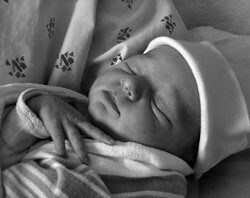 WAPF beauty Lillian Margaret weighed over eight pounds at birth. She and mom Kelly, dad Steve and older sister Elena are all thriving on a nutrient-dense diet. Go to: V1-5 (2000-2004) | V6-7 (2005-2006) | V8-9 (2007-2008) | V10-11 (2009-2010).